Do you want an instructor that is professional, friendly and affordable? Auto Drive is a highly recommend driving school that was established in 2002. 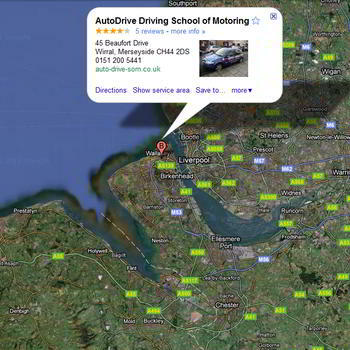 Since then, we have been teaching pupil from all over Wirral. We are a friendly professional driving school and we pride ourselves on the recommendations that we get from our past pupils. Our instructors are based all over the Wirral so you will have a local instructor that will take you to test standard at a pace to that is comfortable for you. Our Driving Instructors are some of the best around and we get results, FAST! If your area is not listed still get in touch as we are adding new driving instructors every month and may now have an instructor in your area.